René Lalique was one of the most versatile jewelry artists working in the twentieth century, in that he was equally successful in two periods of design history. Lalique created both luxurious one-off pieces for fashionable ladies during the art nouveau period and also successfully created mass-produced glass pieces in the style moderne. Lauded during the 1900s for his enameled jewelry designs that prominently featured sensuous women, Lalique’s creations were sold at the famed dealer and art nouveau tastemaker Siegfried Bing’s shop in Paris. Moving from a focus on metals to the medium of glass, Lalique opened his own glass factory in Alsace in 1921, which specialized in manufacturing decorative arts. In 1925, when the sleek style moderne ruled the day, Lalique exhibited his glass creations at the International Exhibition of Modern Decorative and Industrial Arts. At this World’s Fair, Lalique garnered much acclaim for his method of contrasting frosted glass with clear glass. 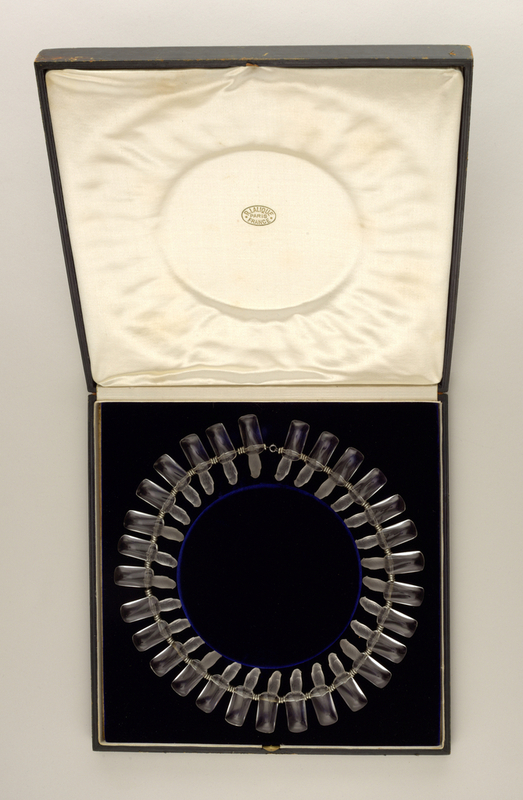 On this necklace, Lalique sought to achieve a high quality method of glass finishing. Intensive methods of polished were employed to create the crystalline finish, and the delicate details on the birds were achieved through wheel-carving. While this glass necklace is a luxury object, Lalique pioneered innovations in glass making that allowed finely molded glass to reach a larger audience through mass production. Lalique had faith in the powers of machinery, and he sought to streamline the glassmaking process to create new innovations in glass. Recent scholarship has shown that René Lalique’s daughter Suzanne Lalique designed many of the glass objects originally attributed to René. In the 1920s, a large part of the Lalique glass production was inspired by her watercolors, that reveal her passion for nature. In the 1920s and 1930s, new and more efficient travel by ocean liners lead to a boom in travel, as people began to vacation in formerly difficult-to-travel-to locations like Bermuda, Australia, and South America. With these new tourists came a demand for objects and interiors that represented these new “exotic” locations, and so Philodendron plants, the jungle, and foreign birds are prominently featured in the decorative arts and fashion of the 1920s and 1930s. A glass René Lalique bowl, on loan from the Cleveland Museum of Art, that is also on display in The Jazz Age: American Style in the 1920s features a row of parakeets like this necklace. Birds proved to be a significant source of inspiration for Lalique, as they appear on his jewelry, vases, bowls, and glass sculptures. Jeremy Howard, Art Nouveau Style: International and National Style in Europe, (Manchester, UK: Manchester University Press, 1997), 24.